Sections already published in this series - more to come! 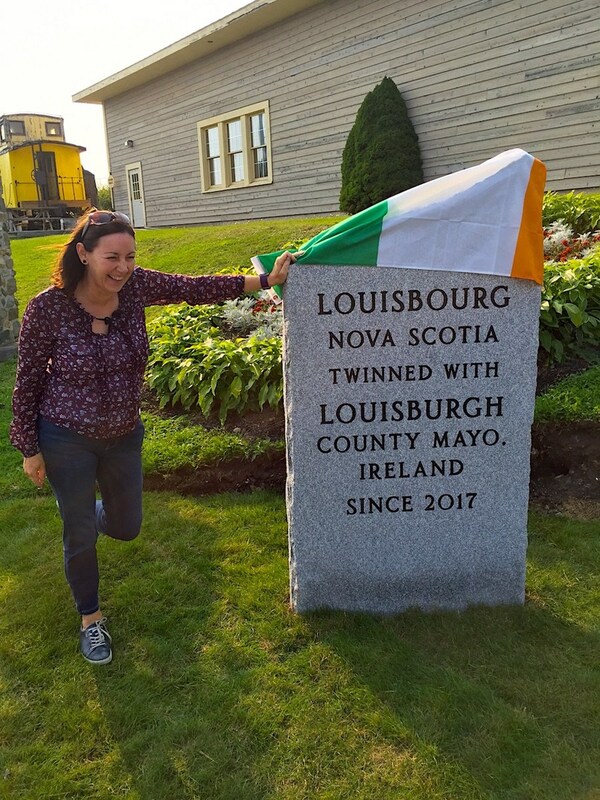 The following shares our adventures on the Nova Scotia leg of our trip along the Irish Ancestry Trail in North America. If you would like to see all of the places we visit on this trip – please have a look back at the overview for the series here. Leaving Newfoundland for Nova Scotia. We were traveling to the “Maritimes” region of Canada comprising the Provinces of Nova Scotia, New Brunswick and Prince Edward Island. This whole area was a target for Irish emigrants from the 1700s – both travelling on from Newfoundland as well as travelling directly from Ireland. Meet our Host – and a Letter to Start. Our plan was to stay on Cape Breton Island for two days and to meet up with Jack and Mary Coffey – natives of the area. We first met Jack Coffey in 2015 when he travelled to Cork on a research mission based around his Coffey ancestors – and he subsequently became one of our Green Room members. 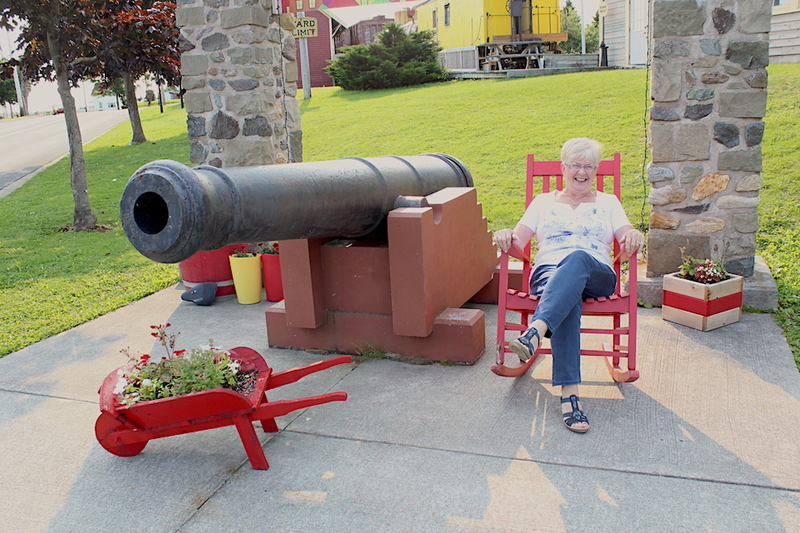 So, long story short – Jack and Mary were our hosts for Cape Breton Island and we were looking forward to seeing the places associated with his Coffey ancestors. Hello, My name is Lawrence Cavanagh and I am a friend of Padric Coffey who has asked me to write this letter for him as he can not read nor write. His Irish Gaelic is very strong and I might miss a few words but here is what he asked me to write for him……. I have decided to leave my home in County Cork Ireland and have sailed to Canada this past season. Things are not good back home, and I do not believe they will improve. The Napoleonic wars have ceased and there is less demand for goods that we produce. I know that I would never be able to own any land, as most of it is under control of rich Englishmen who tax us to death on what we occupy. We can never seem to get ahead. My dear wife, Judith and I got married last September in her church in Kilbrittain. Father John Foley married us. Judith and I met a while back one Saturday when she was helping her father with his cows at the Shambles market up on Kilbrogan Hill in Bandon. She is a very pretty girl and very kind. I spent a lot of time courting her down along the river, and we often meet on the Bandon bridge in the evenings. The rain this year was terrible, crops not doing well, and the muck is up to our knees. When we told our parents that we were thinking about crossing the ocean to a new land where the government is giving land away for free, her mother cried, but her father understood that I would not be able to get much cobbler work, and never have a farm so he told us to go. Both our parents are sad, they know they will probably never see us again. I promised them I would take good care of her. Now that we have arrived in our new country we will look for a land grant and start our family. Judith and I want to farm and I can find work in my trade. I can use my musket to hunt deer and rabbit for food. I will fish in the nearby lakes for trout, cod, salmon, smelt, oysters and mussels. The winters are long and cold here, but the summers can be hot enough to have good crops and the vast forests have enough timber to last forever. I feel in my heart I have made a good decision. Where are you? I am your great, great, grandson from Canada. I have just arrived in County Cork on Air Lingus. I know you spent a month on a ship to get to Canada and I was here in five hours. I am looking for your and my roots. My, my – your family is hard to find. I have searched the internet for hours trying to find something you may have left behind to show that you were here. I have visited the church in Kilbrittain where you and Great Great Grandmother were married. I have talked to many people in my efforts to find your trail. I know you have left something or someone behind and I will keep searching. Love, your great, great grandson, John. Isn’t that a wonderful way to frame this story on the Irish Ancestry Trail? A Little History of Nova Scotia. In 1621 King James I of England named this territory Nova Scotia (New Scotland in Latin) and granted the land already occupied by the Mi’kmaq people to William Alexander of Scotland. Over the following centuries, the province took on sizeable immigrant groups from England, Scotland, France (Acadia) as well as other Canadian provinces. And, of course, many Irish landed on the shores over this time. Nova Scotia had both land and wood in plenty, and became an important ship-building centre taking advantage of this plentiful resource. Of course, the ships carrying loads of wood to Europe needed ballast on the way home – so ports like Halifax offered a reasonable entry point into North America for millions of Europeans, many of whom continued onto other Provinces and States across North America, while others stayed in Nova Scotia to build a family and a new life on plentiful farmland (that had first to be cleared and improved!). By the 2006 Canadian census the four largest ethnic groups in Nova Scotia were Scottish (31.6%), English (31.7%), Irish (21.6%) and French (17.8%). Another 40% gave their ethnicity as just “Canadian” – many of who were probably also of Irish origin. In this section of the Irish Ancestry Trail in Canada, we’ll look at this province through the life and times of just one immigrant Irish family – the Coffeys who arrived from County Cork in 1816 and established the Coffey clan on Cape Breton Island. So, after the gentlest of crossings (yes, we were lucky!) – we were met at the ferry terminal by Jack and Mary Coffey – who immediately took us under their wing for a tour around Cape Breton island. We decided we’d like to head to some places associated with Jack’s Irish ancestors – the Coffey family who arrived in St. Peters on Cape Breton Island from the town of Bandon in County Cork in 1816. But, I think we’re getting ahead of ourselves! Before we explore Cape Breton Island, let’s step back for a moment and look at the original Coffey settlers from County Cork. The Journey Starts in Ireland. Let’s start our journey by heading back to Ireland – specifically to the place where the Coffey family originated – in the little village of Kilbrittain near the town of Bandon in County Cork. Firstly, we have a look at the surname “Coffey” and its origin and links with this part of Ireland. If you go back about 1,000 years in Ireland, you will find an island that was comprised of various tribes (often called “Tuatha”) – ruled over by local chieftains. To the southwest of Ireland, one such tribe – the Corca Laoidh – were rulers in an area comprising much of west County Cork today. By the time surnames came into prominence – O’Driscoll, O’Leary, Hennessy, Coffey, O’Flynn and Dineen would have been the main families across this small kingdom. The O’Hea, Cronin and Dunlea names may also have come out of the Corca Laoidh. However, these surnames came out of the original Irish language that was spoken at the time. The later anglicisation of “Coffey” was not used – although the original Irish of “Ó Cobhthaigh” (more or less meaning descendant of the victorious one) may have sounded like that to some ears. This Irish name was not only anglicised as Coffey, but also as “Cowhig” in some parts of County Cork. It’s all in the pronunciation! By the 1700s, the “glory days” of the Irish Gaelic tribes were long gone – the majority of their members were poor tenant farmers on land owned by a rich ruling class, many of whom administered their estates from overseas. By the early 1800s, Ireland was suffering from a population explosion – the small tenant farms just could not be sub-divided any more. However, opportunity was opening up in the USA and provinces of North America – land was on offer and stories were coming back from early settlers of a tough life, but one where freedom was to be had for the first time. Many Presbyterian settlers left Ulster to become pioneers in this new land – followed by mostly Gaelic Catholics from the ports of Cork and east to New Ross. Let’s Do A Little Background Research. One question that Jack Coffey is still trying to answer is just where in County Cork did the Coffey’s live in Ireland? Let’s do a little background research and see if we can come up with some possibilities or probabilities. So, what we know for sure is that Judith Donovan came from the parish of Kilbrittain – and Patrick Coffey probably came from nearby. The tradition was for a couple to get married at the home church of the bride, and so we discovered that Patrick Coffey and Judith Donovan were married in the parish of Kilbrittain in County Cork in 1815. The other pieces of useful information (when looking for a home location) are the names of the witnesses to both events. The witnesses to such church ceremonies were typically family or neighbours (often one and the same!). In this case, the witnesses to the marriage were William Donovan and John Coffey – while the witnesses for the baptism were Pat Hays and Mary Donovan. So, how do we use this information to figure out where the Coffeys and Donovans lived in Cork? Well, the first clue is that they were married in the parish of Kilbrittain in 1815 – which is probably the home parish of the wife, Judith Donovan. However, we still don’t know if Pat Coffey came into the parish for marriage and if they stayed there afterwards. What we will do next, is to triangulate this information with two of the census substitutes available for about this time. They are the Tithe Applotments (from 1823 – 1827 ) and the Griffith Valuations (1847-1864). But, before we go on we need to talk about the Coffey surname in this part of Ireland. You might remember that Coffey came from the Irish Ó Cobhthaigh. Most of the tenant farmers around Bandon would have used both Irish and English at the beginning of the 1800s – in fact, Bandon town was an English-speaking enclave. So, the surnames would have been constantly translated phonetically in the course of a typical day. In the case of Ó Cobhthaigh, that “bh” sound could be pronounced as both a “V” or “F” sound OR as a “W”. Likewise, the “gh” at the end could be emphasised OR not. As a result, Ó Cobhthaigh was often interpreted phonetically by an English speaker as “Coffey” or “Cowhig” (or at least these are the two spellings that prevailed). Even in the case of Pat Coffey, it’s possible that his name was noted as “Cowhig” on one day and “Coffey” on the next. Remember, his generation was typically illiterate and had little say in the matter. So, in this case we need to be conscious that the Coffeys may have been spelled as Cowhig from time to time. I discovered that a Pat Hays (one of the sponsors above) was also a sponsor for the baptism of Honora Hays in 1826. She was the daughter of a John Coffey (same name as one of the sponsors above) and Catherine Neil. This extra piece of information ties another Hayes and Coffey family together in 1816. So, where did this Pat Hays and John Coffey live in 1826? In the tithe applotments, I found only one Pat Hays in Kilbrittain parish in the townland of Kilshinihan (see the transcription here). In the same townland we also find John and Denis “Cowney” – except this is a mis-transcription for “Cowhig”. This is most likely the same John Coffey/Pat Hays pair mentioned above. So, is it possible that our own Pat Coffey came from this area before moving on to Nova Scotia? It’s hard to tell for certain – but let’s see where the nearest Donovans are (remember, Pat Coffey married Judith Donovan). We find a Daniel Donovan in the neighbouring townland to Kilshinahan – called Knockbrown (see the transcription here). So, we know that we have a Coffey/Cowhig family living beside each other in Killbrittain parish in the 1820s – along with a neighbour called Pat Hays. By 1851, the Griffiths Valuation show a Coffey family still in place (not called Cowhig this time) – but led by a William Coffey (see transcription here). My conclusion from the above is that this is a very interesting set of facts – which bring up the POSSIBILITY that the Coffeys and Donovans came from this part of Kilbrittain parish before departing for Nova Scotia. However, more work needs to be done to develop this theory. I wanted to illustrate how you might develop a possible theory as to the homelands of your Irish ancestors triangulating between Church records and census substitutes. Moving on…..
As I mentioned above, the couple had their first child – John – in June of 1816. Now, given that the Coffey family history tells us that the couple also had a child called John after arriving in Nova Scotia – it is likely that this first child died in infancy and the next male took on his name as was often the tradition in Irish families. Bandon Courthouse – To be Avoided at all costs! I include a picture of the local courthouse above – many of our ancestors are caught on record as they appeared in the local court for all sorts of misdemeanours and property infringements (both real and imagined!). This place [Bandon] has long been noted for the tanning of leather, which is in great demand: there are nine lanyards in active operation, employing more than 100 men. From the great consumption of the breweries, distilleries, and mills, very little grain is exported: the imports are coal, culm, timber (in which a considerable trade is carried on direct with St. John’s, New Brunswick, and Quebec), and iron, which are brought in sloops to Colliers’ Quay, three miles from the town, and thence by land carriage; articles of domestic consumption are brought by land carriage principally from Cork. So, while the Coffeys may have departed from Cork – but it is also possible that they left on one of those return sloops leaving from nearby Colliers’ Quay – which already had an established trade route with New Brunswick and Quebec. The Family Moves from Ireland to Nova Scotia. Can you just imagine travelling under those conditions for a month or more? No wonder they developed the nickname of “Coffin Ships” as they were later used during the Irish Famine, often transporting people with contagious disease and a lack of nutrition providing the other passengers with little resistance to same. Our own sea voyage was immeasurably more comfortable and we pulled into Sydney Mines on Cape Breton island – a scenic drive away from the town of St. Peter’s. About a month after they departed, Patrick and Judith arrived on Cape Breton Island near a place known as Lynches River. Jack believes that the Coffeys had intended to travel further by ship (onto New Brunswick or Quebec), but were so sea-sick that on reaching landfall in Cape Breton – they felt it offered them an opportunity at least as good as any other part of North America. They came across one Lawrence Kavanaugh (from the south-east of Ireland) who had become a successful merchant on Cape Breton Island and he offered them help and support if they settled near his own home-town of St. Peters. The other striking thing about this area of Nova Scotia is the prevalence of “Scots Gaelic” (a dialect of Irish) on the road signs – owing to the influx of native Gaelic speakers from Scotland in the 1700s following the Highland Clearances. The sign above reads well in modern Irish as “Baile Naoimh Pheadair” pronounced “ballya-Neeve-Fadar” – not a sight we were expecting to see! The town of Saint Peter’s has a fascinating history – always holding onto its name, but using several different languages according to its ruling country at the time. First, you had “St. Pedro” at the time of the Portuguese in the 1500s – 1700s. Then, “St. Pierre” as the French took over the area – and finally, “St. Peter’s” in English following the founding of the modern town in the early 1800s. Over the following years, Patrick and Judith built a home and cleared a farm in an area called Lynches River – just a few miles from the town of St. Peters. John – the first of their nine surviving children was born within a year of their arrival. The Coffey family from County Cork had established themselves on Cape Breton Island. The temporary land they settled on belonged to Donald Campbell who had acquired it himself in an earlier grant. On this land, Patrick and Judith built some land for their animals and a small house where they started their family and began to farm; all the while practising his trade as a shoemaker for his neighbours and the greater St. Peter’s community. It was not infrequent, nor uncommon for settlers to pick out a piece of land and become squatters on it. The 1787 moratorium on land grants in the colony prevented many from gaining access to their land. In my ancestor’s case, the land they picked was just across the road from where they lived on Donald Campbell’s land. So they were able to begin improvements on it and erect buildings, even though they did not technically own it until 1854. Under hot summer sun, crisp colourful fall days, foggy wet drizzle and cold snowy winter, Patrick and Judith worked steadily on both pieces of land. They cleared virgin forests, plowed up sod, hauled rocks and soil to establish gardens. They sowed fields of hay and oats for their animals, working steadily and tirelessly. For some reason their neighbour, Donald Campbell, failed to recognise the improvements Patrick and Judith had made on his property – it appears that he refused to pay them for the improvements they had made to his land. Patrick took Donald to the Supreme Court and made a claim against Mr. Campbell for what he thought he should have been paid. After the court session, Patrick was awarded damages and costs. Donald Campbell was ordered by the Judge to pay a total of 35 pounds, 11 shillings and 8 pence. Compared to the terrible situation of oppression and land confiscation Patrick would have been all too familiar with in Ireland, he probably felt quite safe in standing up for his rights in his new country and refused to be bullied and deprived of what he had worked so hard for. The Coffey family thrived in this area of Cape Breton, and over the following decades their descendants spread to many parts of Nova Scotia and beyond to the USA. The Coffey descendants stayed on their St. Peter’s homestead until 1910, at which point Daniel Coffey purchased the Kavanaugh estate in St. Peter’s and moved his family there. This was the original estate of the man who greeted Judith and Patrick off the boat from County Cork back in 1816, so I’m sure that was foremost on Dan’s mind as he cemented the Coffey legacy even deeper in Cape Breton soil. By George Coffey (circa 1928). To one who loves the sea? Back to the hills of home. Taken from “A Harvest of Tales” by Jack Coffey. George Coffey DID return to his beloved Cape Breton island shortly afterwards, where he saw out the rest of his days. The Final Resting Place of Members of the Coffey Family – Behind the above Church. Moving On From St. Peter’s. I think there is more to develop in this story – both regarding the origins of the Coffey family in County Cork – and as you can see, there are plenty more pictures and places to see on a trip around Cape Breton Island – I’m sure we’ll be adding more going into the future. That adventurous young Coffey couple from County Cork have given us a legacy, a path, and an example, to guide us even in the twenty-first century. Mary and I picked Carina and Mike up this morning at the Newfoundland ferry when it docked in North Sydney, Cape Breton, Nova Scotia. What a wonderful day we all had. As you will see on this site in days to come we visited The fortress of Louisbourg where many Irish lived among the French in the 1750’s and again Irish soldiers who served in the English army when the battle for North America was at its height. Also a trip to the area of my Coffey ancestor’s settlement near Saint Peter’s in 1816. A wonderful supper with warm friends wrapped up a long day. Thank you again, Jack – the pleasure was ours – having the opportunity to connect your Irish homelands around Kilbrittain in County Cork with Cape Breton Island and Nova Scotia. How about the rest of our readers – did any of your Irish ancestors arrive or live in Nova Scotia? Please do let us know in the comment section below. Our next port of call on the Irish Ancestry Trail is Prince Edward Island. If you would like to see where else we travel on this tour, you can see all our “ports of call” in this overview article. Have you Visited the Irish Famine Museum?